There weren’t many climbing gyms in Lithuania couple of years ago. Nowadays they started to pop up and most of them are amazing places! This list of climbing gyms in Lithuania is for those who come to the country and still want to practise rock climbing. There are 3 main gyms in Vilnius which are open for public. Some climbing clubs have their own bouldering or lead walls. But for them you need special permission or you have to be student of specific university. Don’t worry, they are not even close to the gyms I am writing about in this article. Bonobo gym is the newest venue in the city. 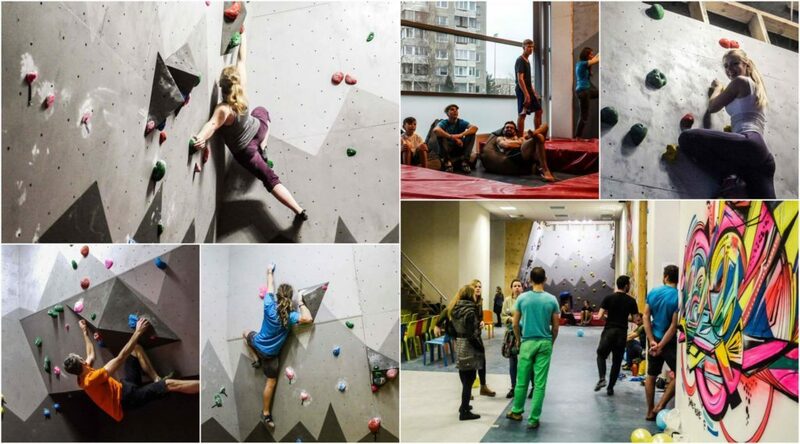 Without a doubt it is also the best climbing gym in Vilnius. 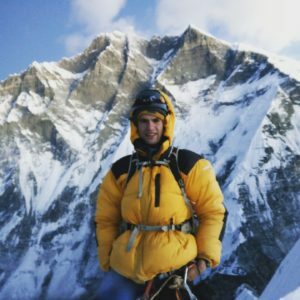 You can find bouldering wall, lead climbing wall, auto belay devices, training area, moonboard wall, couple routes for ice climbing with ice tools. Bonobo team organizes group and private training sessions. They also have terrace inside overviewing all climbing gym. You can be sure that great music will always motivate you to climb harder! If you don’t have shoes or other equipment it is possible to rent everything from the cashier. Small shop which offers climbing shoes, chalk bags & other stuff for rock climbing is also here. There are lockers and showers. Gym is heated in winter time and cooled in summer time. Opening hours: Monday-Friday 14:00-22:00, Saturday-Sunday 12:00-20:00. Montis Magia rock climbing gym is the oldest venue in the city. Recently they opened a lead climbing wall which is part of basketball court. It is quite loud when there is a game there. Lead climbing wall has 3 auto belays, which are good for solo climbing sessions. Bouldering gym is downstairs and it is separate from lead gym. This are has campus board, hanging boards and moon board, which is without LED lights. 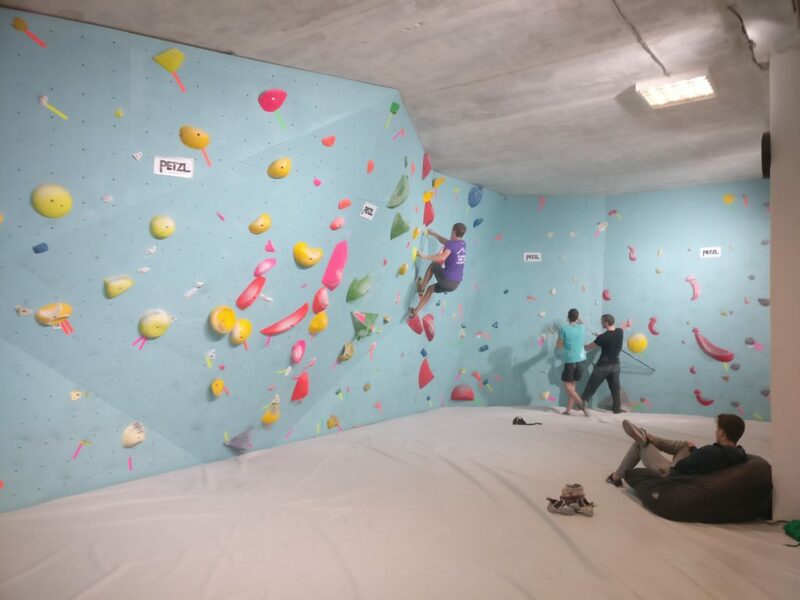 This rock climbing gym is easily reachable from any part of the city by public transport or foot. Route setters in this gym do very good job creating and updating routes. Friendly staff will help you and answer questions you might have. It is also possible to rent climbing equipment from here – harness, helmet, shoes, belay device are available. Montis Magia gym is open for team building events, stag or hen parties. This gym organises group trainings from Monday to Thursday, check out their website for more information. Opening hours: varies, check their website. This place is quite new and I haven’t tested it myself. 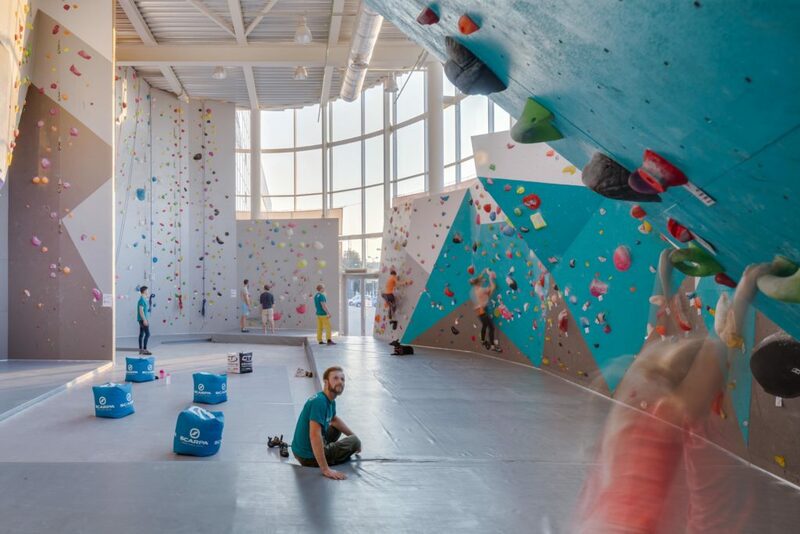 They opened in 2017 and this gym has only bouldering walls to climb. Campus board, moon board and other exercise equipment is also available in the gym. Location is pretty far away from city center, but it might be a good choice for someone living nearby. Opening hours: Monday-Friday 16:00-22:00, Saturday-Sunday 10:00-21:00. 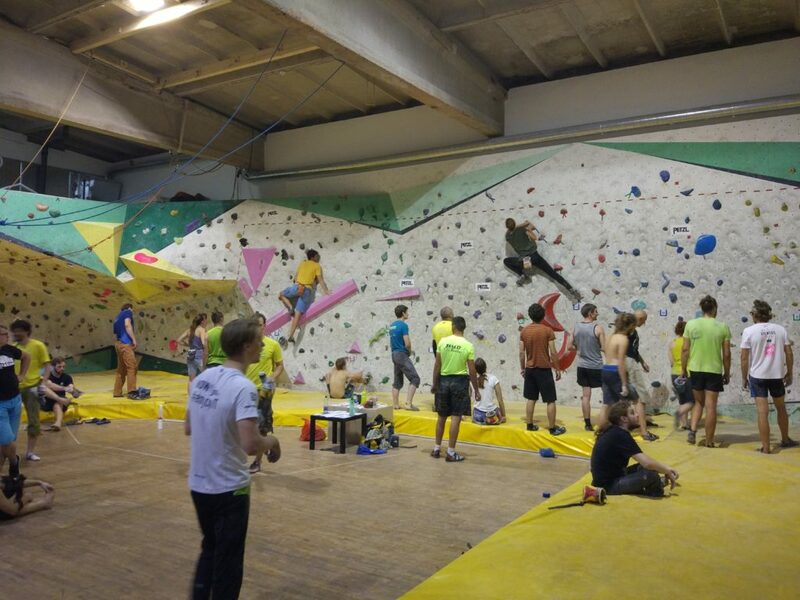 Kaunas being the second biggest city in Lithuania has only one public climbing gym. Nearby Kaunas there are couple spots for outdoor climbing. Pagonijos uola which offers lead climbing, drytooling and Jonava water tower which offers routes with exposure. 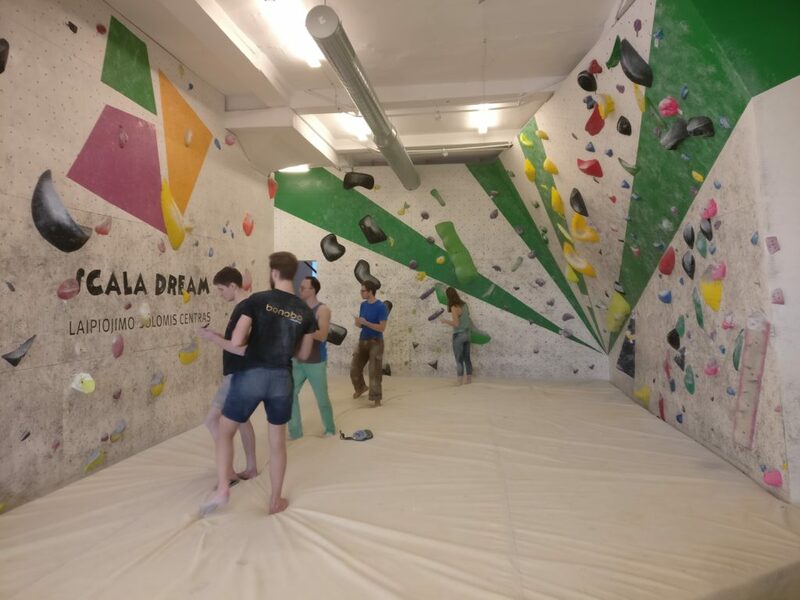 Miegantys drambliai (sleeping elephants) is the only climbing gym in Kaunas. There is only bouldering walls and some easy top rope routes. Sadly, you cannot find any lead climbing gyms in Kaunas, but Vilnius is only 100 kilometers away! Climbing center offers climbing shoes rental. They also have small shop where you can buy necessary equipment. Opening hours: Monday-Friday 15:00-20:30, Saturday-Sunday 12:00-18:00. The port city of Klaipėda has some really strong climbers and really good climbing gym. Sadly, there is only one at this moment, but with the route setters working there it is enough! Scala dream is a bit outside of city center. That’s why they have huge facilities. You can find bouldering walls, lead climbing area, training zone, small cafe and different areas for children. It is possible to buy some equipment including harness, belay devices, chalk in the gym. If you are coming just for one time you can rent shoes and harness for yourself. Opening hours: Monday-Friday 16:00-21:00, Saturday-Sunday 12:00-18:00. Which gym in Lithuania is your favorite one? Montis magia also cater for group events like team building, birthday parties, hens or stags parties. Lead climbing wall there has three auto belays in the area, which opens up for solo training sessions. In bouldering area downstairs you will find a training equipment including moon board, campus board, hanging boards. Therea are training sessions with experienced instructors Monday to Thursday. You can find another hall full of equipment, routes and much more rope related mountaineering school.